I started this post in February of 2012, and re-started it in June 2012, but could never finish and publish. I’m actually 32 now. And we paid off the 2nd car, and had to get a new one shortly thereafter. Most of it is still applicable today, but now we’re actually buying a house. So I’m going to publish what I’ve got and start again. Every now and then, I’ll be doing something and it kind of hits me, that I’m an adult. Of course there are the usual things, paying bills, going to work. Taylor and I have been particularly proud about paying off a car (now two cars!) and a student loan, and being able to save for lasik surgery for him and an Italy vacation for me. All very adultly things if you ask me. But also, sometimes at 30(now 31), I still don’t usually feel like I’m old enough to be trusted with certain things. And Taylor and I about to embark on one of the hugest, most adult things I can think of…A HOUSE! Let’s back up a tiny bit first though. We kind of love renting. We have a nice place with plenty of room. If stuff breaks we just call our complex up and they fix it. If a light bulb burns out or if the battery goes out in our thermostat, they replace it. We don’t have taxes to pay and our renter’s insurance is low. And we save some money at the end of the month. We knew the day would come when we’d want a house. But, we were happy waiting, because that meant we could keep saving and researching so we get exactly what we want. And that time has come to make a decision. Our lease is up soon, and our apartment complex is jerking us around on our rent, so it feels like we’re being thrust into making a decision. So, in February, we got all gung-ho about house hunting, talking with a realtor, doing all the research, deciding where we wanted to live, all that jazz. We had decided on renewing our lease for 6 more months with the hopes of being in a house by August, when our lease would run out again. But alas, that is not the case. There was the initial momentum, when we found a few houses we liked, but that got bought practically the same day they went on the market. Alternate title: Tales of the floor bed and other first world problems. We bought a new mattress about 2 months ago. It is a gloriously comfortable, Simmon’s BeautyRest. With special coils and memory foam. We haven’t slept on our new mattress in over 2 weeks. It’s been hitting 82 degrees most evenings in our apartment since the heat of the summer really set in. We got a little respite from the heat when it rained for a whole week solid. But still, the master bedroom is the farthest away from the air conditioning unit, making it the hottest room in the house. Luckily, we hadn’t gotten rid of our old mattress yet, so when we figured out the spare bedroom is the coldest room, we decided to pull down the old mattress and make a floor bed. You see that futon up there. We slept on it a couple nights before we made up the floor bed. It’s actually got some kind of real mattress on it but it’s size makes it either a one night or a one person option. The apartment management said there isn’t anything they can do even after checking it at least 3 times and recommended we just set our thermostat at 74 to try to maintain some kind of coolness (HAH!) So the air runs all.day.long. and finally shuts off between midnight and 3am. It also doesn’t matter if we do or don’t cook. Or if we do or don’t run the washer and dryer. And in the mean time, the heat and the Olympics are making us lazier than normal, so all our clean clothes are making good use of the new mattress as a makeshift closet. Seriously, so ready for the heat to let up. So somehow last summer I missed posting this, so instead of a garden update from last year, I’m changing it to a comparison of this year vs last year, almost exactly to the day too. 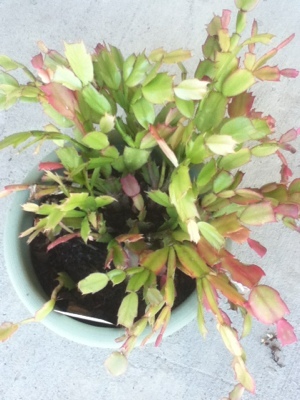 I really thought the Christmas cactus was a goner after last year but it is doing well. 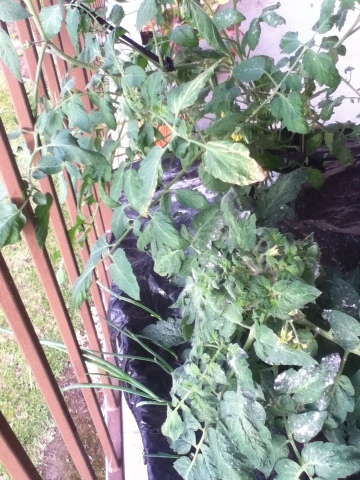 The tomatoes mostly failed last year, except for one plant that produced about 4 tomatoes. Spinach. Didn’t last very long, not even long enough to make a proper salad. Not attempting this year. 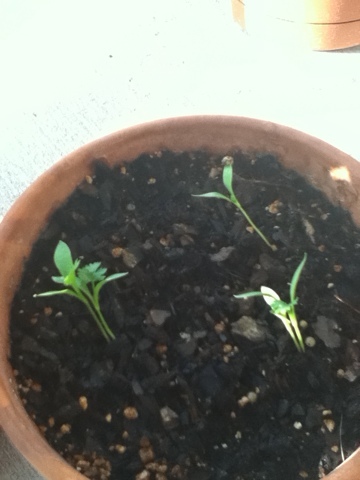 Cilantro 2011- died shortly after this was taken. No attempts this year. 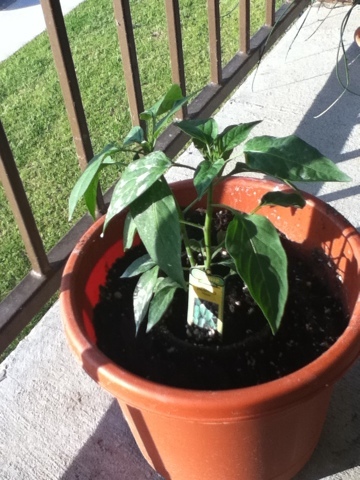 Jalapeno plant 2011. Got infested with some bugs and I didn’t want the infestation to spread to my other stuff so I threw it out. Didn’t buy another this year. 2011. 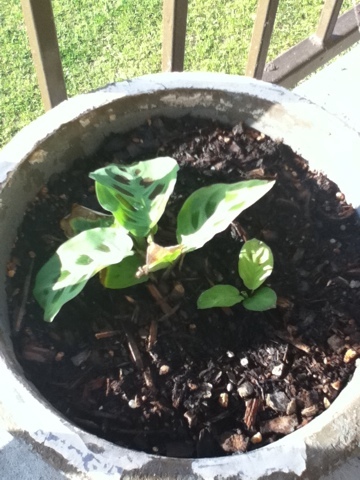 Grew basil from seed. Had way too much until it started to get that chemical-y smell and I tossed it all out. 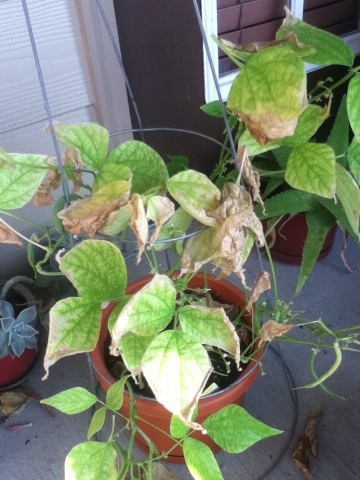 This year I bought a plant instead. 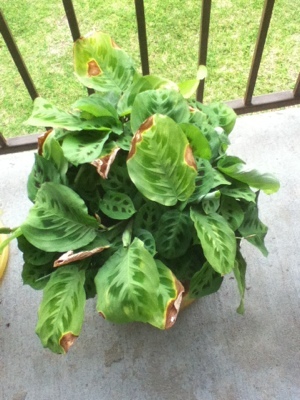 Prayer plant 2011. I didn’t think it was going to make it but it rallied in the past year. 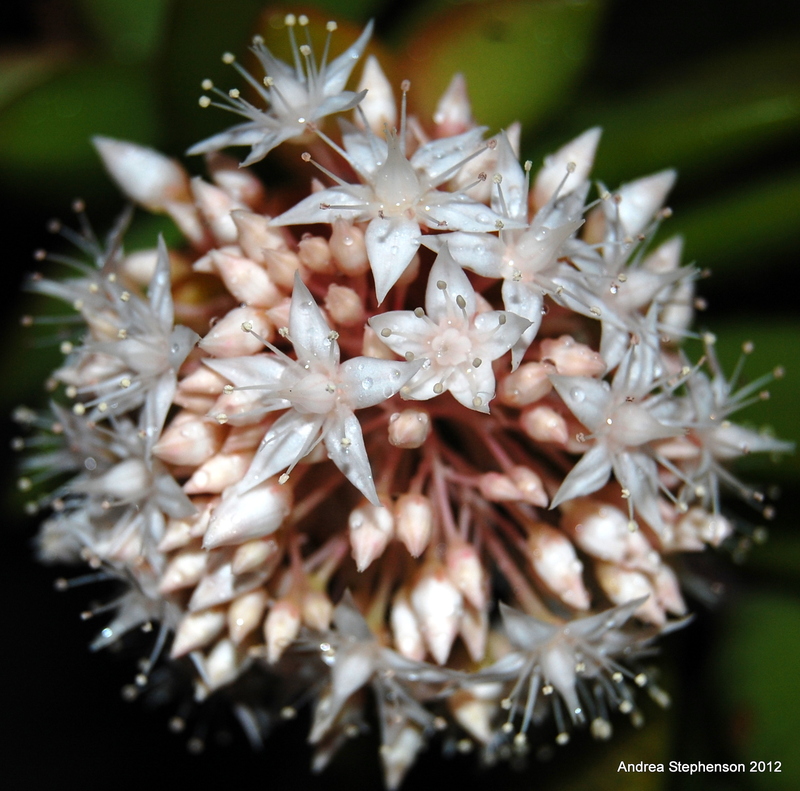 Chives 2011. Still kicking it this year. 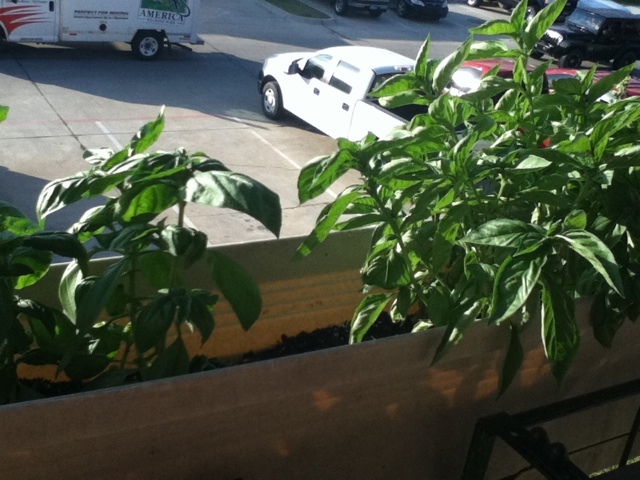 Lettuce 2011. Died shortly after. Like the spinach, barely enough to make a proper salad. 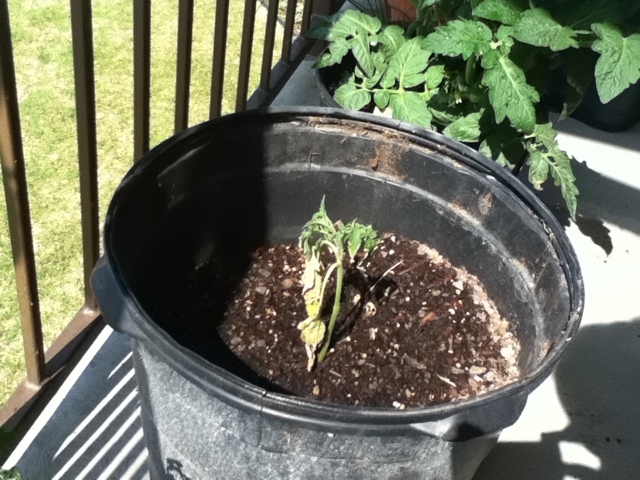 So this is my mutant cherry tomato plant. You might recall, it looked like this just about 3 weeks ago. 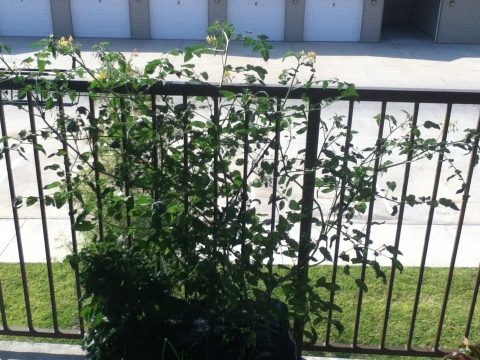 And now it’s grown to about 5 feet wide and almost 4 feet tall. 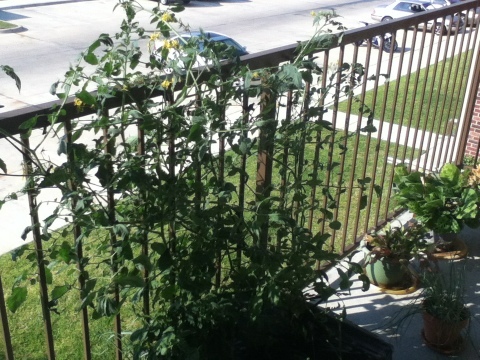 You can barely see the other tomato plant to the left, since the mutant is clearly overshadowing it. Thank goodness I had an old, holey pair of tights in my drawer. 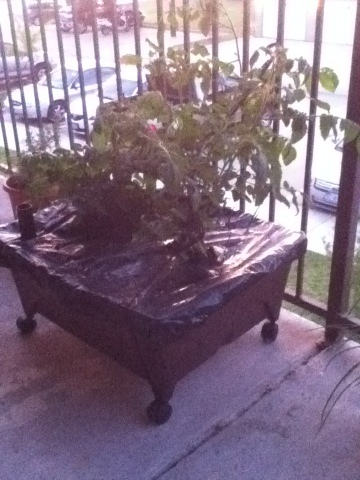 I’ve been using strips of tights to tie the branches of the plant up, since a regular cage won’t work in my planter box. Here’s what the mutant looks like from the parking lot. 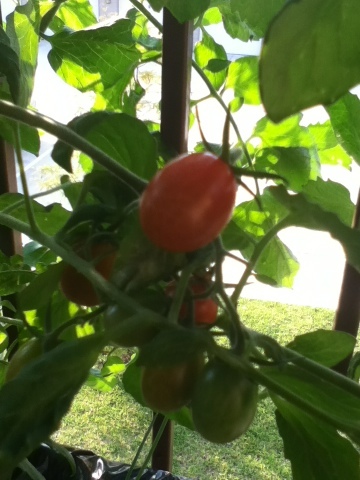 The first bunch of cherry tomatoes is starting to turn, and there are at least 10 more bunches. 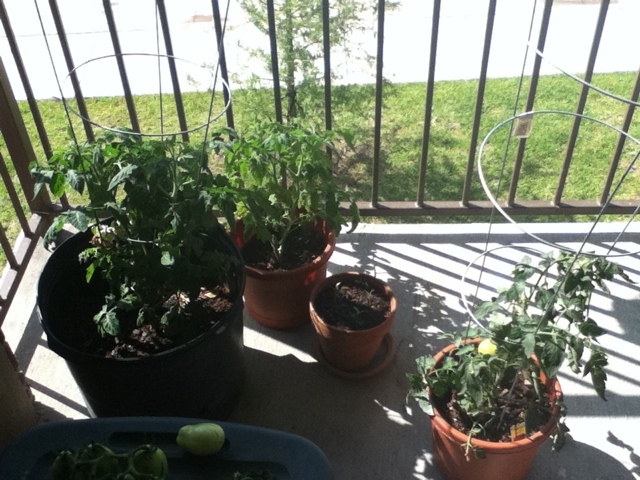 I can’t wait to eat fresh, home-grown cherry tomatoes this summer. 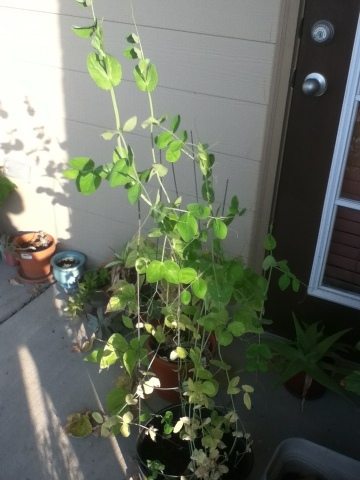 The snap peas still give me a tiny glimmer of hope since they keep growing taller and taller, but there haven’t been any blooms, so I’ll just keep waiting, likely until they die. 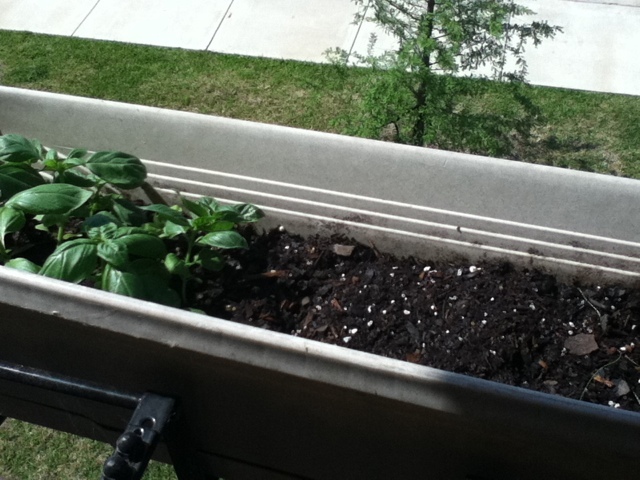 I don’t have a picture, but the basil, chives and rosemary are doing great. 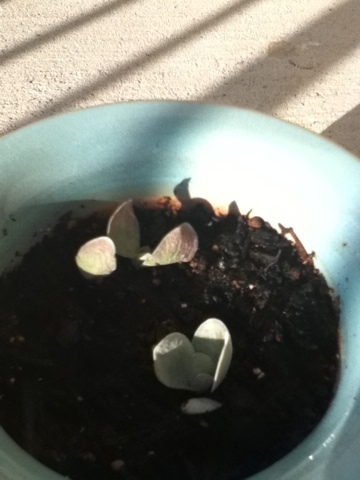 The onions are doing fine, but still have a long way to go. 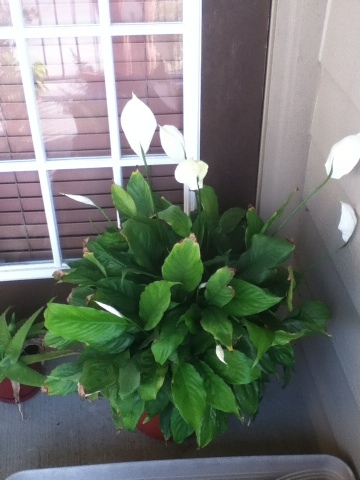 And last, the giant peace lily that I always keep in the dark corner of the patio is doing really awesome this year and has put out almost 10 blooms so far. 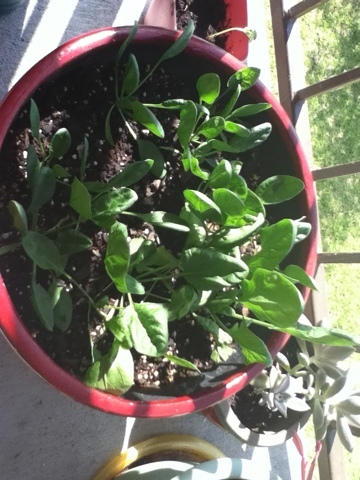 I attempted red onions, a couple tomato plants, some snap peas and some green beans. Here’s how things looked on April 11th. 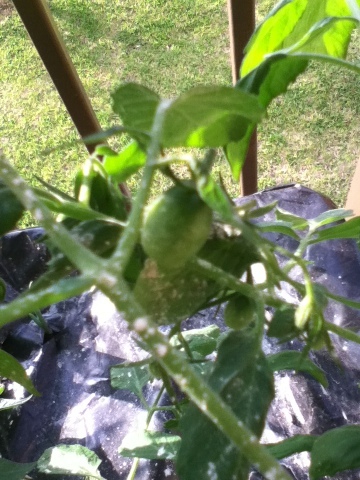 Here’s a blurry shot of the tomatoes starting to grow. 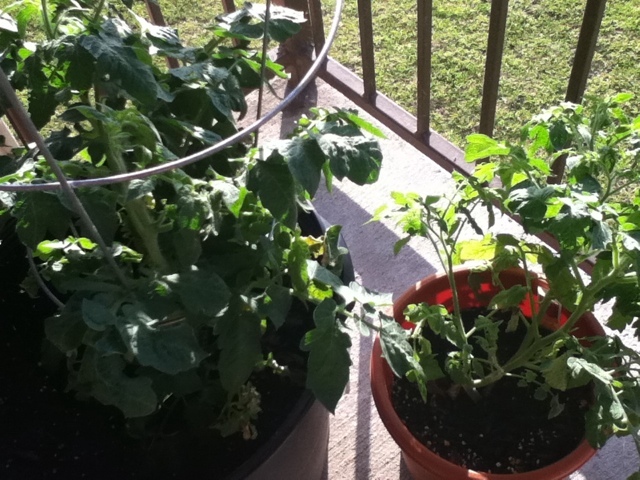 One plant is cherry tomatoes and the other is 2 inch tomatoes. 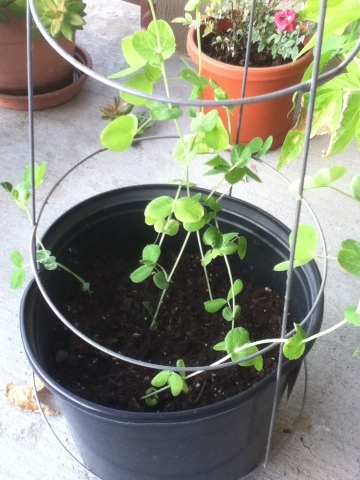 I also figured out that putting the beans in a different container would be best, and they are doing really well. 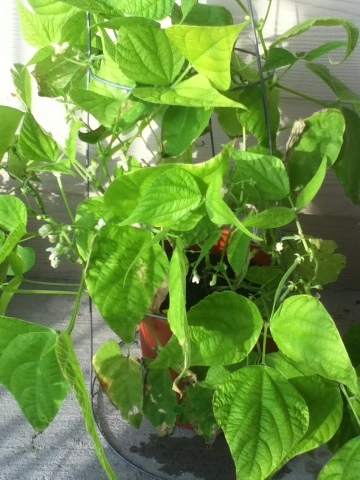 There are already green beans growing! 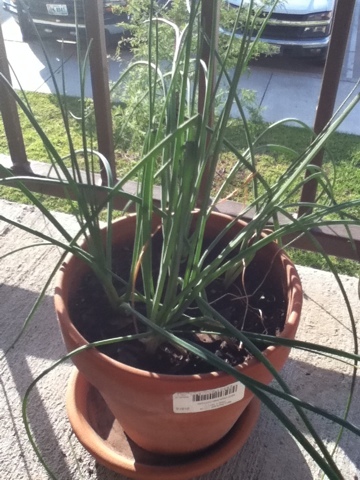 I’ve also got some chives have have been doing well for almost a year. 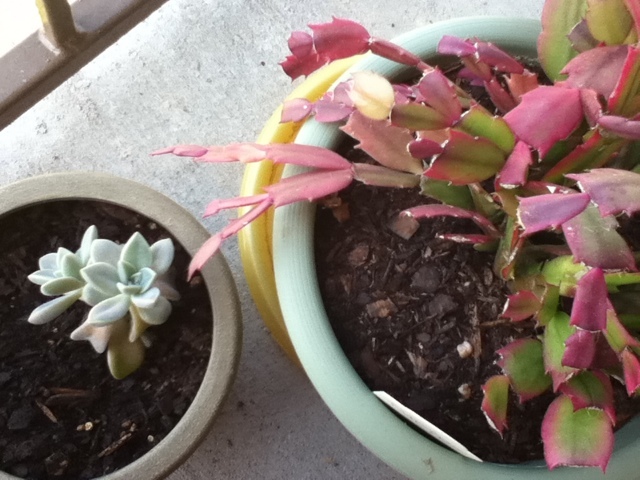 And here’s just another small sampling of my succulents. 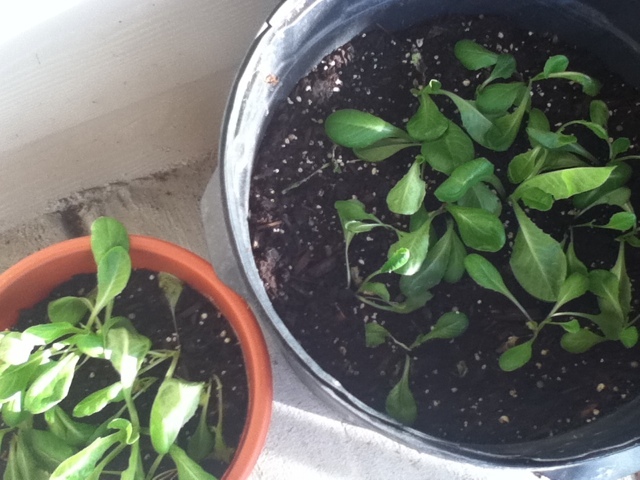 I’ve got too many offspring plants and I really need to stop letting them grow. Or maybe I should start giving them as gifts. 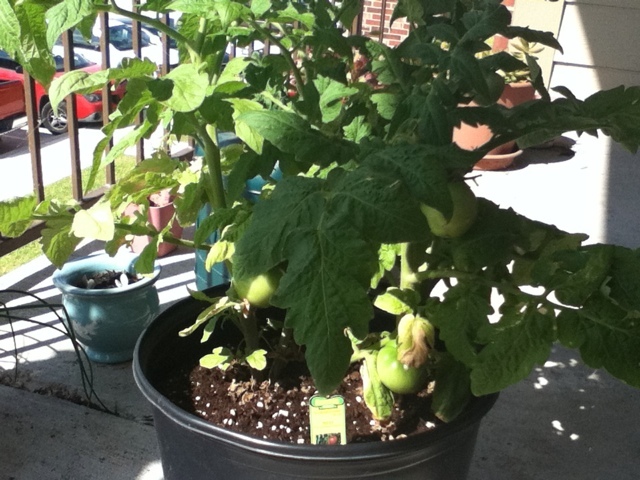 I hope you liked seeing what’s growing in my patio “garden”. 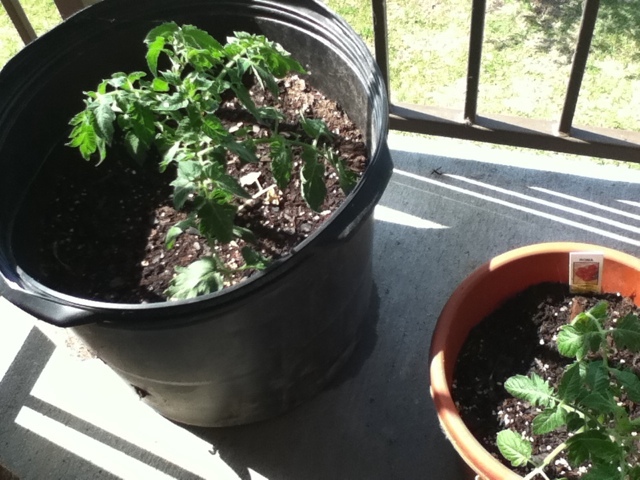 I’ve also got rosemary, basil, a peace lily, and a couple other random things out there too, but mostly, in the summer I like trying to grow stuff I can eat. I’ll let you know how things turn out when they are ready to eat. 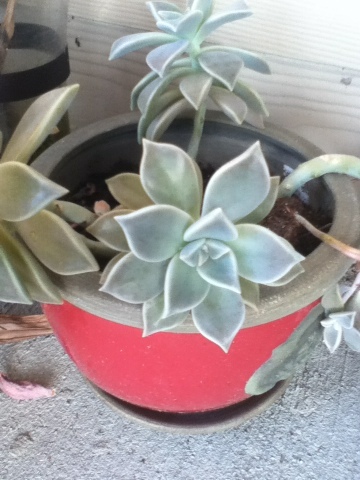 I have this succulent that I got from my mother-in-law a few years ago. 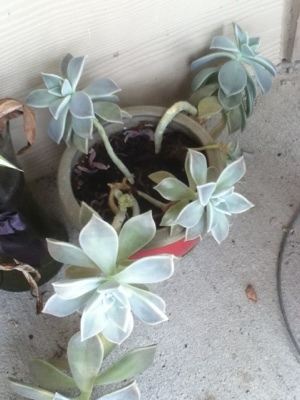 It’s grown quite large, and I’m not exactly sure what kind of plant it is, but recently it started flowering and the flowers are pretty cool. 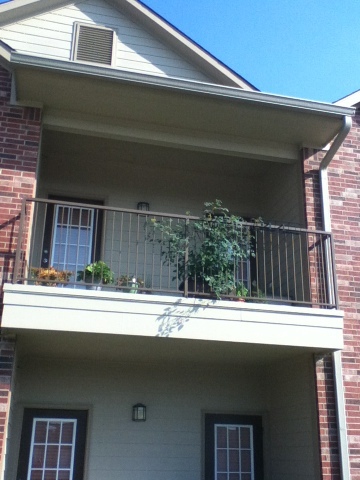 The middle stage, with some of the flowers already blooming. 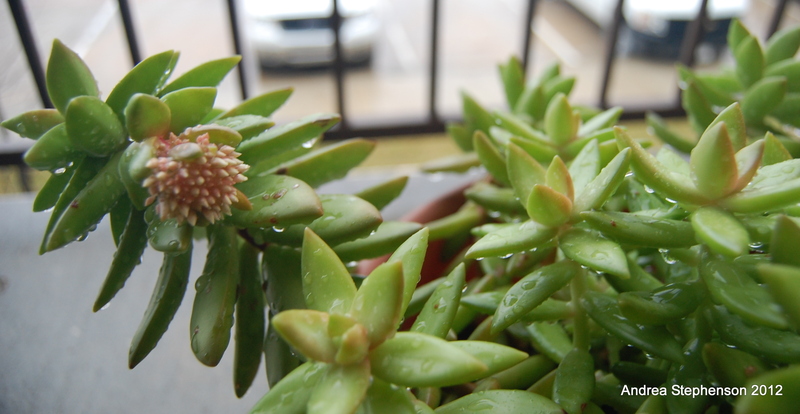 This is my favorite picture, mostly because of the crispness and some of the water droplets I managed to capture. 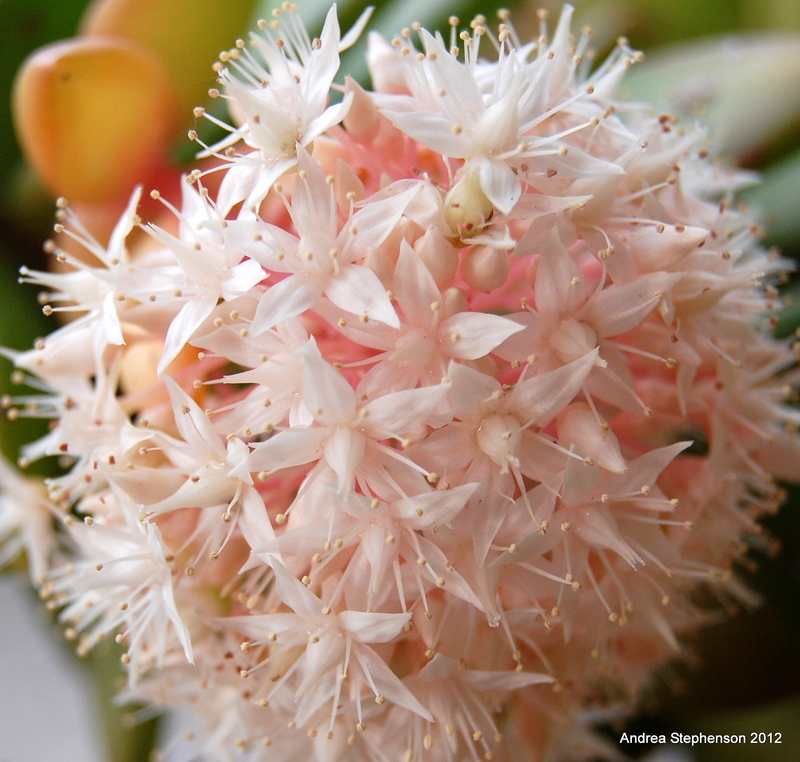 And last, here’s one with almost all the buds blooming.